The pair of USD/CAD in 4H chart . the pair tries to overcome the resistance level of 1.2585 and is trying to gain a foothold above it if it will succeed, then perhaps increasing the pair to the resistance level 1.2640. If not, then drop to the support level 1.2545. Prices move sideways in the highest price range 1.27997 to 1.23505 lowest price, there are two areas resistant (blue box) and two support area (red box), and we see a tendency How did the price of a move into the support area, where prices have been two tries to break through, but always failed. Trends of moving up the first time test resistance area, the price can not reach the area resistant, only able to approach it, it shows the existence of a bid price that can not be traded higher than the offer price in the near area resistant, and is currently only able to move prices approaching the second resistance area, where sat it if the price is not able to move beyond the highest price nearby, then it is likely to move back down towards the support area. We recommend to sell near the resistant areas, SL above 1.27997, and TP in the support area at the bottom near the price lows, or at the price of 1.21035. The pair of USD/CAD in 4H Chart. the pair is trading down and is now approaching support level 1.2400. If it is broken, then open the way to support level 1.2370. Further fall is limited. It is expected to grow by a pair of the nearest resistance levels. WEEKLY HAMMER AT SUPPORT SEND USDCAD HIGHER. USDCAD (weekly) has been moving sideways since the beginning of February. The proximity of the year 2009 high has caused the sideways move. I suggested in my analysis at the time that USDCAD should move above the latest highs as US economy is stronger than the economy in Canada. The fact that USDCAD has maintained the support well and has now created a weekly hammer candle at the support supports my view. Bears might point out that Stochastics oscillator and RSI (7) have created lower highs and therefore signal that the momentum is waning. This however, is what happens each time price moves sideways. Therefore, oscillators do not tell us anything we wouldn’t know by reading price action. Nearest support and resistance levels are at 1.2409 and 1.2835. The year 2009 high at 1.3064 would be the next major resistance once price moves beyond the 1.2835. Price action in the daily chart points to the upside. 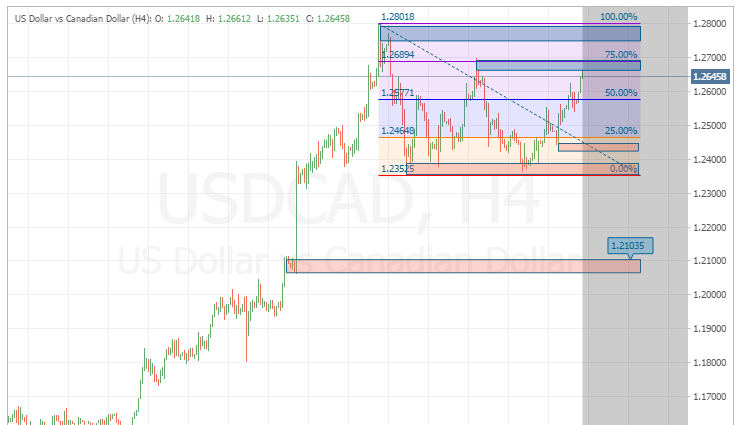 USDCAD has found support from the area near the 38.2% Fibonacci level and the lower Bollinger Bands. Last week Stochastics moved to oversold territory and the 50 day moving average catched up with the price. Friday’s close well above the hammer candle high was a bullish sign and created a hammer candle in the weekly chart as well. After being held back by the 50% Fibonacci level and a pivot high price is now breaking higher. This is very much in line with the bullishness in daily and weekly charts. The pair broken out of the wedge formation and projection from the formation points to the resistance zone between 1.2724 and 1.2760. Support levels are at 1.2621, 1.2531 and 1.2409. Long term technical picture is bullish as institutional buying has created a hammer candle at the support. The latest weekly low was also higher than the pivot low in the weekly chart from the mid February. Short term picture supports this as price has broken out of a wedge formation in the 4h chart and has closed above the Friday’s daily hammer candle. As the setup in the higher time frames is favourable I am looking for pullbacks to technical levels at 60 and 15 min charts. The range at 1.2724 – 1.2760 is my target for this price move. USDCAD technically, next immediate resistance above at 1.2305, 1.2326 and 1.2400 levels. Down side support below at 1.2225, 1.2213 and 1.2200 levels. USDCAD is currently moving up to the level of 1.42511, Bollinger Bands indicator signaling the market still have a strong upward trend, so the market is still expected will move up to the level of 1.42833. USDCAD is currently moving down to the level of 1.40905, RSI indicator shows the market still have a strong downtrend, so the market is still expected will move down to the level of 1.40619. Date : 29th January 2016 (Second Report). CURRENCY MOVERS OF 29th January 2016. The CAD has been gaining strength in recent days as crude oil prices move higher following speculation that oil producers will reduce supplies. Also, providing some support for the CAD is the fact that the BoC left rates unchanged when the markets were forecasting a cut by 25 basis points. CAD traders for today should keep an eye on today’s Canadian economic calendar since on tap are the November GDP and Dec Product price Index. Also, keep an eye out for the U.S. Advance GDP q/q data released later today; this could also impact the USDCAD volatility for Friday. Technically, for the USDCAD I am expecting a price bounce in the wake of the corrective sell off since the pair hit a multiyear high near the 1.4680’s last week. USDCAD traders may look to enter into long positions within the “Price bounce zone” ((B1) above chart) between 1.3815 – 1.3970, for targets within the “Lower top zone” ((T2?) above chart) 1.4340 – 1.4430.